Instant Pot Chicken Thighs: How to make perfectly seasoned instant pot chicken thighs with crispy skin in the pressure cooker. Directions for cooking frozen chicken thighs as well. I am one of those blessed people who gets to talk to her mom just about every single day. 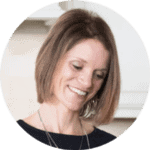 She calls to check in to see what my kids are up to, hear how I am feeling thanks to Cystic Fibrosis, and she always wants to know what I am making for dinner. 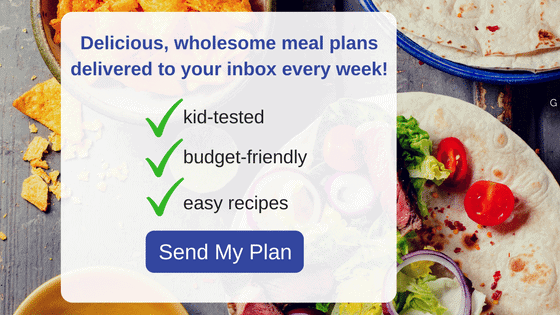 Even though my mom follows my meal plan, so her meals are planned, she likes to see what sort of recipes I am testing or trying out and often she weighs in with her opinion. Lately, she has been asking for two things: Chicken Thigh Recipes and Instant Pot Recipes. So being the good daughter I am, I knocked both out with this easy recipe for perfectly cooked Instant Pot Chicken Thighs. I have to tell you that truthfully, I am not a huge fan of chicken thighs. I am much more of chicken breast kind of person. BUT my boys and my extended family will take chicken thighs over chicken breast any day of the week. Therefore, I needed to create a perfected chicken thigh recipe for them. And so I set out to make the best, easiest chicken thigh recipe for the instant pot. And my biggest critics (AKA my family) give their full seal of approval on this instant pot chicken thigh recipe. The meat is tender and moist and the skin is crispy, and not the least bit rubbery. Bottom line, Instant Pot Chicken Thighs will be on repeat in my house! I find that my Homemade Seasoned Salt is the perfect rub for chicken thighs, along with so many other things from oven baked fries to Barbecue Chicken Drumsticks. Personally, I am not a fan of skin on meat. BUT, I know that 99.9% of the population lives for the crispy skin on chicken–so don’t worry, I have you covered. Turn your pressure cooker to the Saute Function and let heat. Add in 1 tablespoon oil. Once the oil has heated, place your chicken thighs, skin side down, in the instant pot to sear. Sear on both sides to brown the chicken thighs. Once you have seared your chicken thighs, remove the thighs from the inner pot of your pressure cooker and place on a plate. Pour in 1/4 cup water and scrap off any browned bits off your inner pot. This will help keep you from having issues with burn warnings and/or your Instant Pot not sealing correctly. Pour 1 cup of water into the pressure cooker. Add the trivet or rack into the instant pot. You need a full cup of liquid in order for pressure to build and pressure cooking to be possible. Place your seared chicken thighs onto the trivet. Place lid on pressure cooker and be sure your vent knob is pointed to sealed. Set to high pressure for 9 minutes. Once cook time has elapsed, allow pressure to release for 5-10 minutes. Save bones from roasted chicken thighs to make Instant Pot Chicken Stock. What temperature should I cook Chicken Thighs to? According to the USDA, chicken is cooked safely when it reaches an internal temperature of 165 degrees Fahrenheit. So I like to cook my chicken, be it on the grill, the oven, or in the instant pot, to just about 160 degrees. That way when I take it off the heat, and let the chicken rest, the temperature will reach 165 degrees without the chicken drying out. I will tell you that to achieve just about 160 degrees in your pressure cooker is quite tricky. My technique of searing the chicken thighs 1 minute per side and then cooking on high pressure for 9 minutes has worked well for me. If you let the meat sear longer than 1 minute per side or let pressure release longer than 5 minutes, your chicken thighs may be well over the 165 degrees internal temperature, but I bet it will still be tasty! My pressure cooker doesn’t have a Poultry setting–what setting do I use to cook chicken? No worries! Poultry setting on your pressure cooker is just high pressure. Set to high pressure for suggested cooking time. Can you cook FROZEN Chicken Thighs in the instant pot? Yes!! But your process will be a BIT different than cooking fresh chicken thighs, as you can not sear frozen meat. Place your trivet in your pressure cooker and pour in 1 cup of water. Place frozen chicken thighs on trivet and lightly sprinkle with seasoned salt. Seal and cook for 15 minutes on high pressure. Once cook time has elapsed, let pressure release for 5-10 minutes and then remove chicken thighs to a plate. At this time you may want to season a bit longer. You can either brown your chicken thighs right inside your instant pot or under the broiler. To crisp skin in instant pot: drain the water and turn to saute. Add in 1 tablespoon oil and then sear meat for 1 minute per side. To crisp skin in broiler, place chicken thighs on sheet pan and broil under high until skin is crispy. Proceed with recipe, including browning the chicken to get a golden exterior and then decrease cooking time to 8 minutes on high pressure. Skip browning the chicken thighs, place skinless chicken thighs on the trivet (over 1 cup water) and increase cook time to 10 minutes on high pressure. Proceed with recipe, including browning the chicken thighs to get a golden exterior and then decrease cooking time to 5 minutes on high pressure. Skip browning the chicken thighs, place boneless, skinless chicken thighs on the trivet (over 1 cup water) and cook for 6 minutes on high pressure. Can I brine my chicken before cooking in my electric pressure cooker? Yes, you can brine your chicken before cooking in your pressure cooker. Refrigerate your chicken thighs in the brine for at least 4 hours up to 12 hours. Remove chicken thighs from brine and pat dry with a paper towel. Season your chicken thighs with garlic powder, paprika, and onion powder if desired. I don’t like seasoned salt? What else can I use? If you don’t happen to like seasoned salt, you can simply sprinkle the chicken with salt and pepper or your favorite spice blend before cooking. Lemon Pepper seasoning or Dill Seasoning are both great alternatives to homemade seasoned salt. How to perfectly cook seasoned chicken thighs in your pressure cooker. Season your chicken thighs with the seasoned salt. Turn your pressure cooker to the Saute Function and let heat. Add in 1 tablespoon oil. Once the oil has heated, place your chicken thighs, skin side down, in the instant pot to sear. Sear on both sides to brown the chicken thighs, about 1 minute per side. Once you have seared your chicken thighs, remove the thighs from the inner pot of your pressure cooker and place on a plate. Pour in 1/4 cup water and scrap off any browned bits off your inner pot. This will help keep you from having issues with burn warnings and/or your Instant Pot not sealing correctly. Place your trivet into your pressure cooker and pour in 1 cup water. Place your seared chicken thighs onto the trivet and seal to close. Let pressure release naturally for 5-10 minutes. Do a quick release of any remaining pressure. Let chicken rest to reach internal temperature of 165 degrees and serve. Place your trivet in your pressure cooker and pour in 1 cup of water. Place frozen chicken thighs on trivet and lightly sprinkle with seasoned salt. Seal and cook for 15 minutes on high pressure. Let pressure release 5-10 minutes. I use canola oil to sear chicken thighs, but olive oil, coconut oil, or avocado oil will work. Feel free to use any seasoning you like on your chicken thighs. If you are worried about your chicken thighs not cooking fully, sear as directed and then cook for 10 minutes on high pressure--they will reach over 165 degrees internal temperature at this cook time. Always check with an internal thermometer if worried. To cook skinless chicken thighs: Proceed with recipe, including browning the chicken to get a golden exterior and then decrease cooking time to 8 minutes on high pressure or skip browning the chicken thighs, place skinless chicken thighs on the trivet (over 1 cup water) and increase cook time to 10 minutes on high pressure. To cook boneless, skinless chicken thighs: Proceed with recipe, including browning the chicken thighs to get a golden exterior and then decrease cooking time to 5 minutes on high pressure or skip browning the chicken thighs, place boneless, skinless chicken thighs on the trivet (over 1 cup water) and cook for 6 minutes on high pressure. Can you use skinless thighs and skip the browning step? Or skip the browning step if you don’t like skin? Would you need to adjust timing? Thank you! You can absolutely make these without the skin and/or skip the browning. I would just adjust the cook time to 10 minutes on high pressure 🙂 Enjoy. Is there anything the IP cannot do?? I’m in love with it. And I looooove chicken thighs, so I’m really looking forward to trying this recipe! It can be hard to figure out how to cook each type of meat in my new instant pot. Thanks for the tips and recipe! You bet Taryn! I really try to make it as easy as possible for you! Since you mention coconut oil,I presume that ghee is alsookay to use 9since itis also asolidfat). Man do these look super tasty and I bet that are really juicy because of the steam that collects in the pressure cooker. For sure going to try these! You nailed it Billy, the moist heat of the pressure cooker keeps these chicken thighs super juicy! Love finding new ways to use my Instant Pot that I haven’t thought of before. Can’t wait to try this. I am obsessed with my Instant Pot and found your clear instructions to be so useful. Chicken thighs are my go to on busy nights because they are hard to ruin. I am so glad my directions made sense for you! Enjoy! I know it would be! Easy is the name of the game! I forgot to take my chicken thighs (legs attached too) out of the freezer last night to thaw. I didn’t discover this fact until close to 5 pm, too late to defrost them, but I had bagged them individually before freezing, so I logged onto the Internet and found your instructions for cooking from frozen.. Less than 30 mins. later I was dishing up the best teriyaki-sake steamed chicken I have ever made. Thanks so much! Oh I am so glad you found this recipe and it saved dinner!! Would you change anything for using bone-in breasts instead of thighs? I saw your reply in the post on boneless skinless breasts, but that post was older than this one. It also looked very similar to this, without the searing part. Hi Dee!! For bone-in breasts I would season and sear the meat just as you would chicken thighs. However, I would cook bone-in chicken breasts for 15-18 minutes on high pressure as a bone in chicken breast is much larger than a chicken thigh. Hi Laurie! Yes you can double this recipe. You will just want to sear the chicken thighs in batches. The cook time will remain the same as it is based on size of each chicken thigh, not total weight in Instant Pot. Now, it may take a bit longer to come to pressure. Enjoy! This timing worked perfectly. I don’t really like Chicken Thighs, but my husband loves them. I’ve struggled to cook them properly on the stove or in the oven, so this was incredibly helpful to finally have a successful chicken thigh without almost serving them raw! I made them with bbq sauce and salt and pepper, so good. Hi Brittany! I am right there with you, my husband and son love chicken thighs, but I am not the biggest fan, but even I enjoyed them in the Instant Pot. And so glad the directions were spot on for you!! Hi Kristen great to meet you. I just got an instant pot and need recipes especially for frozen chicken thighs! 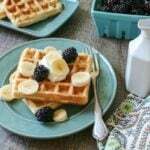 I searched it and found your site, I read that you are a mom with CF. I have a daughter with CF who is also doing great! Thanks for the recipes! Can I use chicken broth instead of water and make gravy? Absolutely Tiffany, that will be delicious! Hi Jeff! I am sorry your skin was not crispy after cooking, this can happen if you don’t sear it really well in the beginning of cooking–but I love broiling the meat after pressure cooking myself. That is how I crisp up the skin on chicken wings and my whole chicken. I did your chicken breasts recipe with pineapple juice…and that was amazing!! Thank you from the very bottom of my heart for all your tips. You’ve made me a true IP junkie! I purchased boneless, skinless frozen thighs from CostCo (new to our town, took the old Sam’s Club space we had) which has some kind of “special” freezing to help prevent freezer burn. What would you recommend for these? I am hoping to do some from frozen, and some thawed. But I have literally no experience with thawing ANY meat (bad childhood, little life skills in some places), and sort of afraid to do it. I don’t want to make my kiddo sick, as she is only 3.5y. For tonight, for the thighs from frozen, I am going to try the 1 cup water, seasoning, 15 manual high, NPR to 5-10, and browning a bit in pot after. 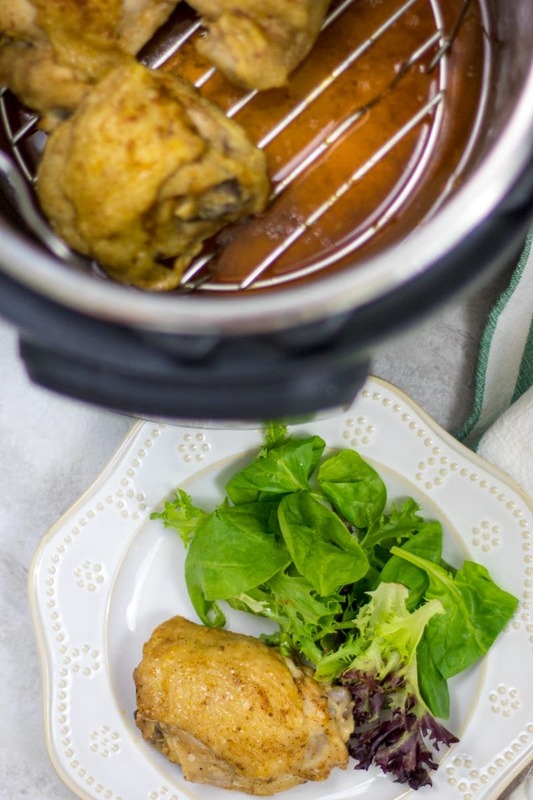 I love hearing that I help you LOVE your Instant Pot–that makes my day 🙂 As for chicken thighs–sounds perfect for the frozen thighs. For thawing chicken of any kind, I recommend putting frozen chicken in bowl (or if in package on plate) and defrosting 12-24 hours in the fridge. The danger comes when you leave poultry thaw at room temperature of leave in the fridge for days and days. Hope that helps! 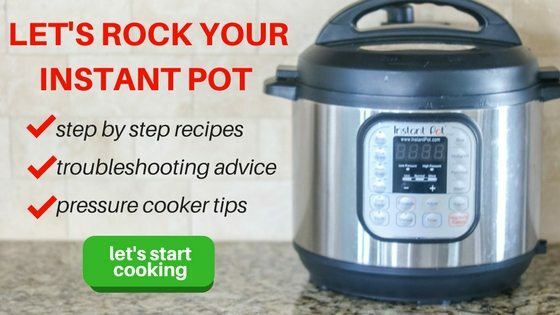 I am happy to help and love hearing that you have such great success with my Instant Pot Recipes. What can you do if you don’t have the rack? You can cook in chicken stock but the skin will get rubbery and wet. I would just peel off skin and enjoy.